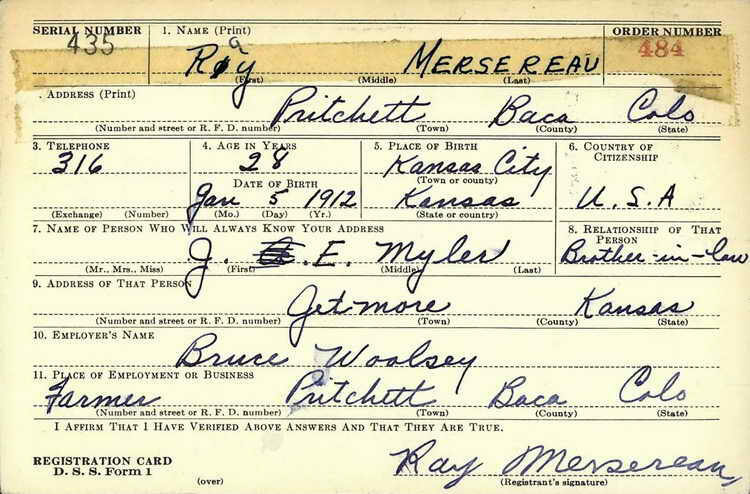 Ray enlisted in the Army on 15 April 1942. Pvt Mersereau first appears in available Morning Reports on 17 March 1943 when he was attached to Company D, presumably from Hq 2nd. Two weeks later, Company Order #3 appointed him to the grade of Pfc as of 1 April 1943. On 23 July 1943 Pfc Mersereau was transferred to Hq 2nd. Om 3 November he was appointed to the grade of T/5 and on 11 February 1944 he was promoted to T/4. On 2 April 1945 he was again moved to Company D. Om 2 October 1944, T/4 Mersereau was transferred the 14th Reinforcement Depot, presumably to facilitate his rotation back to the U.S. He was discharged on 30 November 1945.